Nugville Prepares For The Big Game! Nugville University, Nugville, CO—Fans are gearing up for the big game this weekend against historic rivals, Hempton. The Nugville Nuggets have won the past 4 games against the Hempton Biofuels, and local fans are coming out in droves hoping, to witness the potential record-breaking 5th win. Following last week’s victory over The Margaritaville Parrotheads, in which star quarterback Chad Buddingson ran 59 yards in the previous inning to score a 3-point field goal, The Nugville Nuggets have been undefeated this season. Sports commentators have noted, however, that the majority of the Parrotheads showed up at halftime inebriated since the game was held on a Sunday morning. Local fan, Dustin Eisel—“Diesel” to his friends—had this to say about the big game: “Man, screw Hempton. What’s so good about these hemp bastards, anyway? Oh, you can make an itchy-as-all-hell sweater? Maybe some rope? Well, I got some rope for you, buddy.” Diesel then proceeded to make several exaggerated gestures to his crotch. Our interview with Diesel was cut short when a Hempton resident shouted “Get smoked, nugget,” and threw a lighter at Diesel. Diesel then chased after the man, assuring him that he would turn him into paper and wrap himself up in his carcass. The game is not without controversy, however. Accusations of doping have been leveled at both teams. 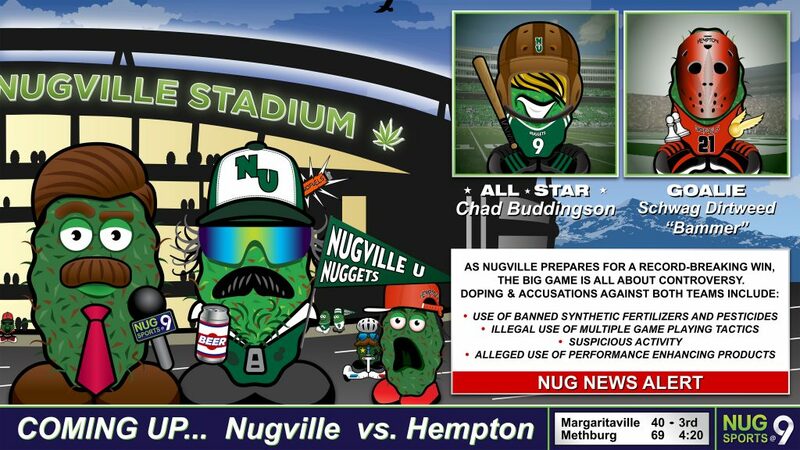 Nugville’s own star player, Buddingson, has been accused of using banned synthetic fertilizers and pesticides after smashing the wicket from the outfield, capturing the qidditch and promoting two of his pawns all in one game. Likewise, the Biofuels’ star player, Goalie Schwag “Bammer” Dirtweed, has come under scrutiny because he has a suspicious face. Extensive testing is being conducted, but so far, no players have been revealed to be using performance-enhancing fertilizers, pesticides or grow-lamps. This will be the last game The Nuggets play this month since the scheduled game against Methburg next week has been canceled due to last year’s incident.